Hello friends! I hope you've had a wonderful week! We're gearing up for what they are calling a "Monster Storm" along the east coast...please remember the east coast in your prayers this weekend as Hurricane Sandy blows through. Although it's been a busy week with not much time for stamping, I did find time to experiment with a new technique and the new sketch at The Sweet Stop! Creative Nugget: A tutorial for the Stained Glass Technique can be found on the Sweet 'n Sassy Member Forum at Splitcoaststampers...just click on the link for more information on this fun technique. The Sunshine Designer Papers by My Mind's Eye were backed with True Black card stock and stitched to a Vintage Cream card front. The finch collage image from the clear stamp set, Under His Wings by Sweet 'n Sassy Stamps, was stamped in StazOn Jet Black ink on a piece of transparency. Copics were used to color the image on the back. I also stamped the image on a piece of DP the same size as the transparency. A frame was cut using Spellbinders dies. Dimensionals were added to the back of the frame and adhered to the front of the transparency image. More Dimensionals were added to the back of the transparency and it was adhered to the stamped DP layer, lining up the images. Hope that makes sense to you! Some cheesecloth was added before popping the panel onto the card. A bow and a sentiment were added following the sketch design. I know I will be using this technique again! to the Sugar Baby Team! Thanks so much for stopping by! 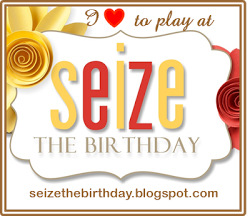 Stop back again on Thursday for a Sweet 'n Sassy DT Favorites Blog Hop! We will be kicking off a whole month of special sales, wonderful challenges, and amazing prizes to celebrate Sweet 'n Sassy's Fifth Anniversary! Have a glorious weekend! Happy Saturday to you all! I hope you've all had a wonderful week...it's the third Saturday of the month...that means it's time for a Sweet Stop Sketch With a Spin! 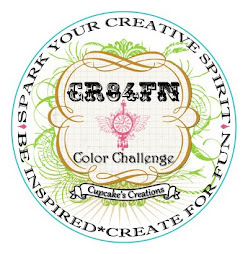 Be inspired this week by a movie or book, upload your creation over at The Sweet Stop, and you will be eligible to win a $15.00 gift certificate to the Sweet 'n Sassy Stamps Store. I must admit that I do not watch many movies or watch much TV, but every once in a while, I'll enjoy an old classic, especially as Christmas draws near. One of these is White Christmas. 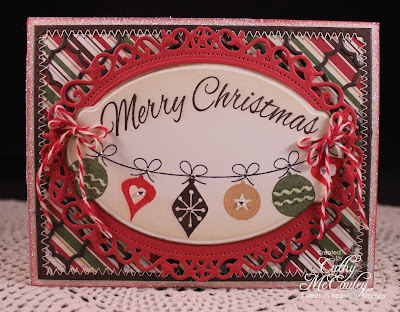 I just love the "Old Fashioned Christmas" clear stamp set just released by Sweet 'n Sassy Stamps (currently unavailable). The horse drawn sleigh reminds me of a scene in the movie White Christmas, so that is what I used for my sample. Creative Nugget: In keeping with the title of the movie, a classic color combination of whites, creams, and kraft was used. A snowflake embossing folder was used to give texture to one panel, and my favorite Canvas Impression Plate was used on other panels. The background DP is from the Christmas This & That Paper Pad by Echo Park. Antique Linen Distress Ink was used to stamp the image on one panel, but this was too light for the main layer, so the image was white embossed on Kraft card stock instead. Straight and zig-zag stitching was added to each layer before adhering everything to a Neenah Solar White card front. The sentiment , also from the Old Fashioned Christmas set, was stamped in Walnut Stain Distress Ink. Some seam binding was tied through a Spellbinders snowflake die cut and some pearls were added to finish off the card...a classic card inspired by an old classic movie! Hope you like it! Check out the movies and books that inspired the other Sugar Babies. We can't wait to see what inspires you! Thanks so much for stopping by...I sure appreciate when you do! Have a fabulous weekend! 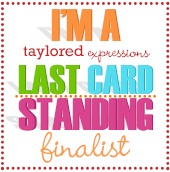 Hello friends...just a short post to let you know that I am hosting the "Ways to Use It Challenge" over at Splitcoaststampers today. My love of coloring began a looooong time ago when I would sit for hours with my Crayola Crayons and a coloring book! So my challenge for today is to revert back to your childhood and get out those crayons...Crayolas or Watercolor Crayons. Creative Nugget: The background for my card was made using the Melted Crayon Background technique. Red, pink, and white crayons were melted on a hot, craft iron and smeared onto a piece of glossy card stock. The postcard heading from the Vintage Postcard clear stamp set by Sweet 'n Sassy Stamps was stamped using Archival Jet Black ink and then dried with a heat gun. This was embossed using a Tim Holtz embossing folder. 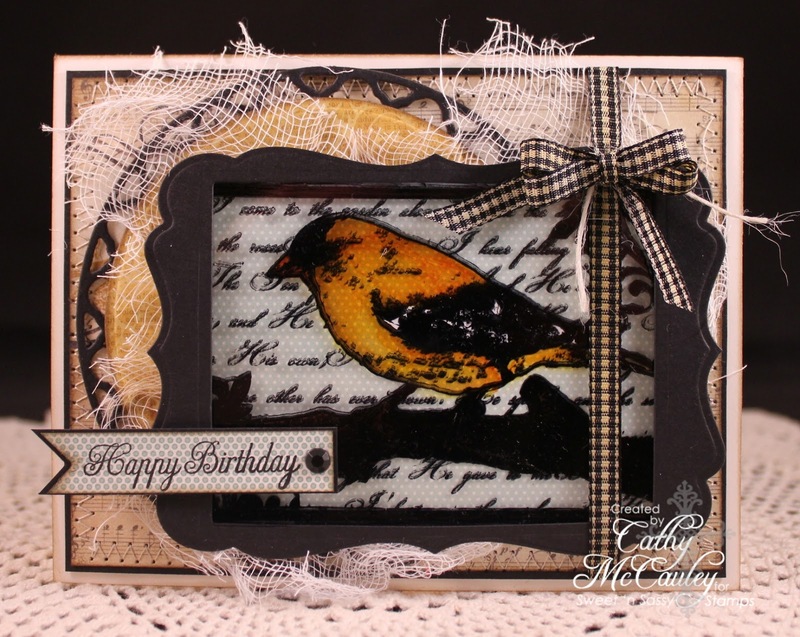 The melted crayon panel was mounted on True Black card stock and a Vintage Cream card front. Another layer of Echo Park DP mounted on a border punched piece of True Black was added. 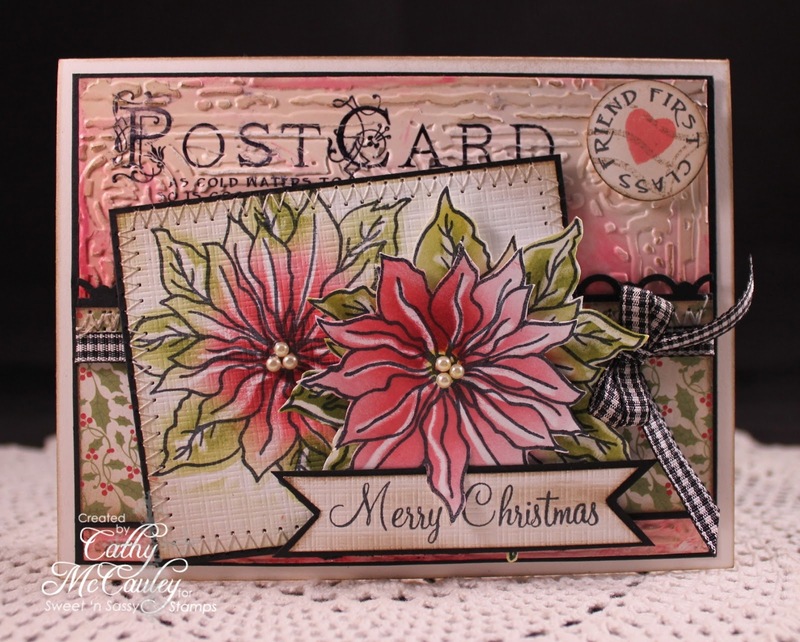 After stamping the Poinsettia, also by Sweet 'n Sassy Stamps, several times on Neenah Solar White, a white crayon was used to color highlights on each leaf. Worn Lipstick, Aged Mahogany, and Peeled Paint Distress Inks were then sponged on the poinsettias. 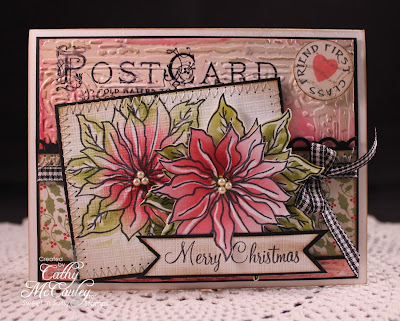 The poinsettia panel was embossed using the Canvas Impression plate while other poinsettias were cut out and layered onto the panel with Dimensionals. Black gingham ribbon and pearls finish the card. If you get some stamping time today, try having a little fun with some crayons, and come join the "Ways to Use It Challenge" over at Splitcoaststampers! Hope to see you there! Hello stampin' friends! Not only is is Saturday and time for a fun new sketch at The Sweet Stop, but this weekend I'll be thinking of you as I am working at the Sweet 'n Sassy booth at the Heirloom Rubber Stamp & Paper Arts Festival in York, PA! If it's anything like last year's show, my wallet will suffer a tremendous blow! LOL! If you're anywhere near York, stop in and say, "Hi!" 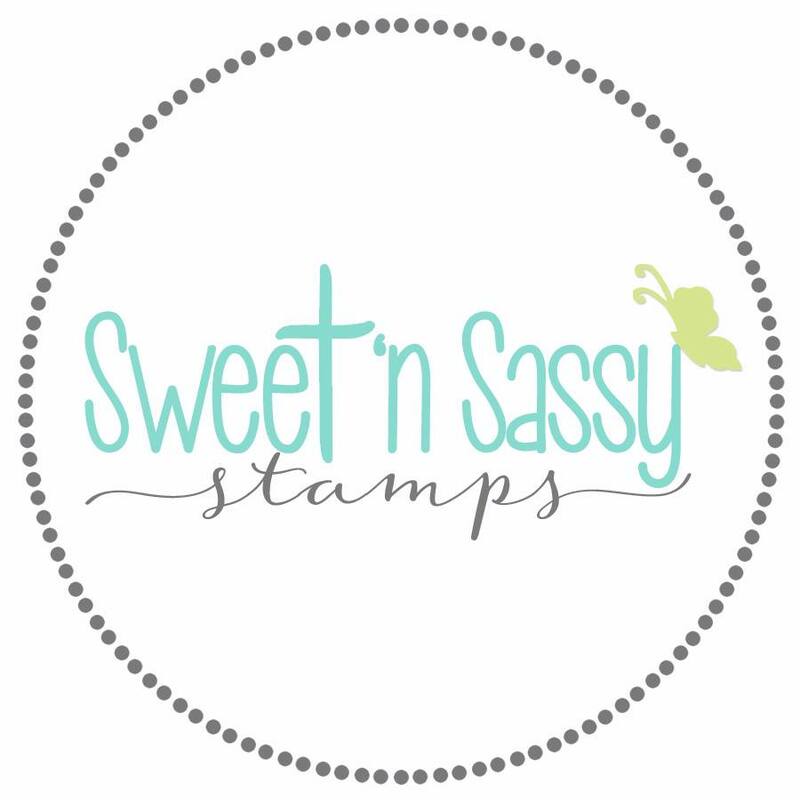 Before you come go to Sweet 'n Sassy's Member Forum at Splitcoaststampers for a fabulous discount coupon! Now...on to my sample for this week! Creative Nugget: I loved this week's sketch...wait a minute...I say that every week, don't I! LOL! I began building my layers by stitching some new Indie papers by My Mind's Eye to Chocolate Chip card stock and adhered them to a Vintage Cream card base. 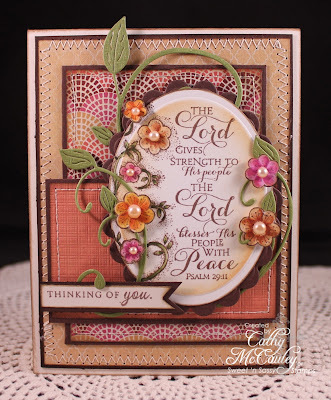 The sentiment from the "Scripture Series 3" from Our Daily Bread Designs was stamped onto Neenah Solar White with Rich Cocoa ink and framed with the flower flourish from the "Be Joyful" set, also by ODBD. The flowers were colored with Copic Markers to match the DP. This was cut with an Oval Nestie and framed with a Scalloped Oval. Cheery Lynn Fanciful Flourish Die cuts were used to further frame the wonderful sentiment. I always use Stampin' Up! 's Photo Corner Punch to make my fishtail banners...that way I can make them any size I want. The Thinking of You sentiment was mounted on some Chocolate Chip card stock and added to the card as well as some pearls to the center of the flowers. What do you think? 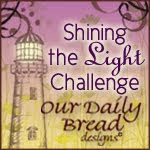 I will also be submitting this card to the ODBDSLC125 Challenge which was to use a sentiment and fall colors. If you haven't done the Sweet 'n Sassy October Release Blog Hop yet, scroll down to my last post for the details...there's still time to qualify for the $25 dollar prize! 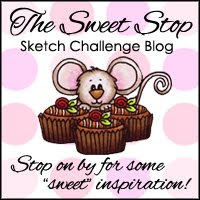 Then hop on over to the Sugar Baby blogs for some more wonderful inspiration for this week's sketch challenge at The Sweet Stop! Thanks so much for stopping by for a visit...I always appreciate and enjoy when you do! Have a wonderful weekend! Hello dear friends and Happy Release Day to you!! 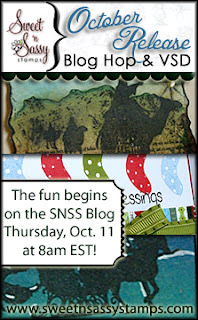 The SNSS DT has been busy preparing for today's fabulous blog hop and virtual stamp day and we hope you will join us in celebrating our newest stamp sets--this month we are focusing on Christmas! If you've just arrived from the very talented Jessica Flick, you are on the right track. 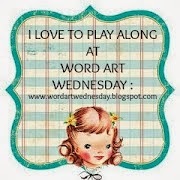 If not, you'll want to head on over to the Sweet 'n Sassy Stamps Blog to start the hop at the beginning. We've got lots of eye candy to share that will certainly put you in the holiday mood. 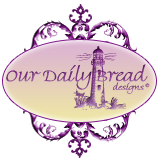 :) Be sure not to miss a single stop along the way because we'll be drawing one lucky commenter from a random DT blog to win a $25 credit to the store!! I'll be sharing projects from two of the wonderful Christmas sets being released. 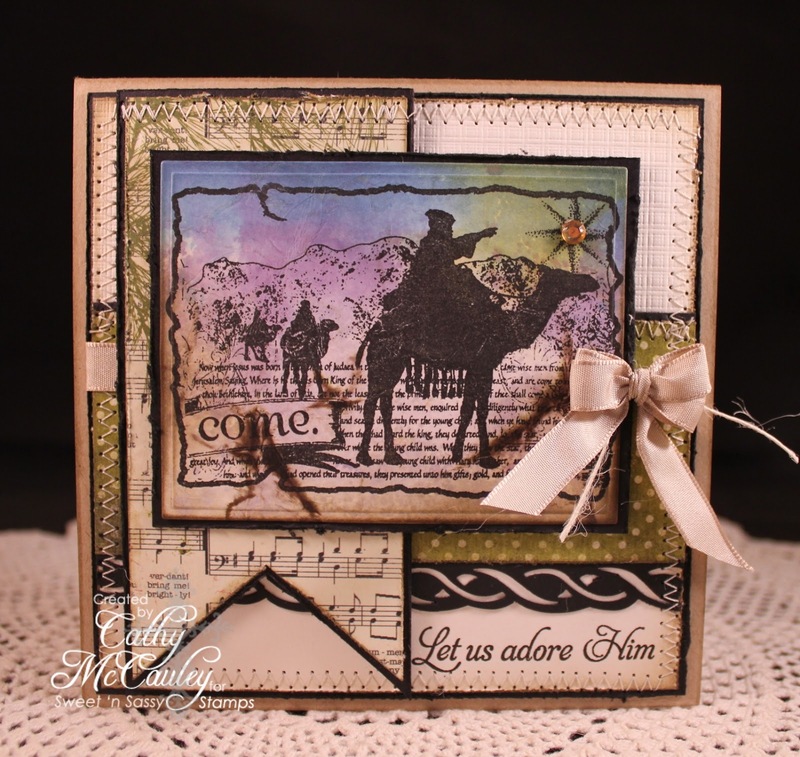 Creative Nugget: The Seek Him Still clear stamp set includes one collage image, one star, and five sentiments perfect for sharing the true meaning of Christmas. I know this set will get a lot of use. The patterned papers from the Festive Collection by Authentique were matted on True Black and stitched to a Vintage Cream panel. This was adhered to a Kraft card base. To make the main image panel, some Frayed Burlap, Faded Jeans, and Dusty Concord Distress Inks were swiped on a craft sheet. This was spritzed with water and a scrap piece of Vintage Cream card stock was dabbed onto the beaded inks and dried with a heat gun. The wise men image was stamped with Versafine Onyx Black ink. A rectangle Nestie was used to cut out the image. This panel was scrunched into a ball and opened up. A Walnut Stain Distress pad was swiped across the folds to create an aged look. The panel was ironed before mounting it onto the card with Dimensionals. The sentiment was stamped on the bottom, a Kraft bow and a rhinestone sticker were added to finish the card! Creative Nugget: My second sample is from the Holiday Baubles clear stamp set. This set includes twenty-three whopping images and four Christmas greetings, providing endless design possibilities! 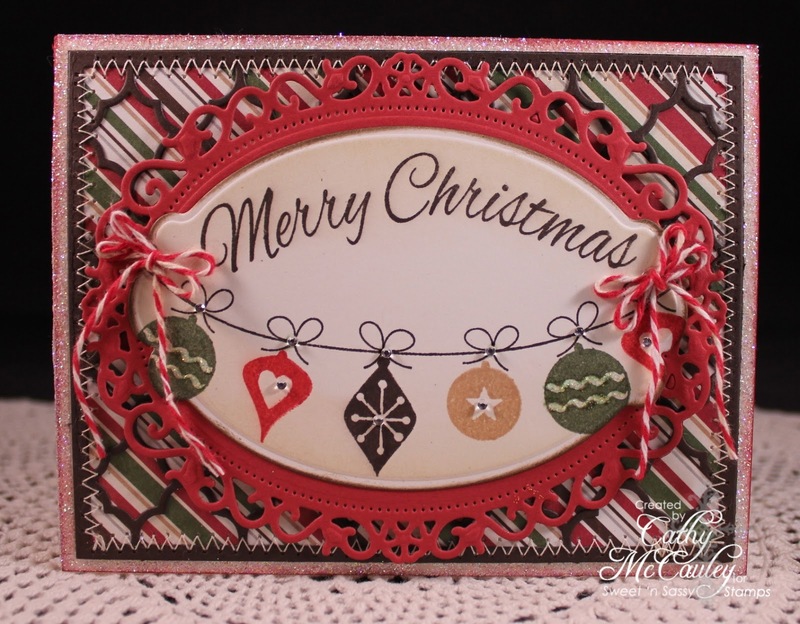 The Quatrefoil Cutting Plate Die by Taylored Expressions was stitched to a piece of patterned paper from the Very Merry Christmas paper pad by Echo Park. This was adhered to a Vintage Cream card base that had the edges taped and glittered. The Floral Oval Die by Spellbinders was cut from Riding Hood Red card stock. Since I needed a large sentiment, I used the Merry Christmas from the Christmas Sentiments clear stamp set, also being released today! The sentiment was curved on the acrylic block making it rounded to fit the contours of the die. The ornaments were added to the string of bows with Always Artichoke, Riding Hood Red, Early Espresso, and Creamy Caramel ink. Some Baker's Twine bows, Rhinestone Stickers, and Stickles finish the card. I hope you've enjoyed my samples! Are you getting in the mood for Christmas yet? The fun has just begun...there's a lot more inspiration to come. Hop on over to the very sweet and talented, Mary Faus for another taste of Christmas! After you're done hopping we invite you to join us for a fun day of challenges during our Virtual Stamp Day in our Splitcoaststampers Member Company Forum. 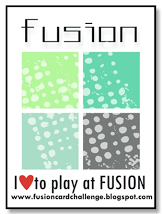 We're giving away more fun prizes so you won't want to miss it! Enjoy the hop and happy stamping! Hello all...hope you've had a good week! It's been rainy here and very busy, so not much stamping time or time for walks with Kody. But today is Saturday...I don't have to work...and it's time for a new sketch at The Sweet Stop, so things are looking up! 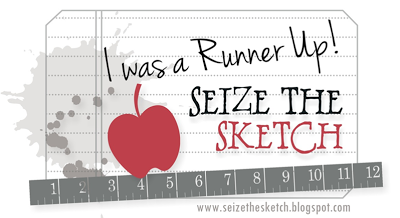 We have a wonderful sketch for you this week with lots of layers. Masculine cards are a little challenging for me, but we have a really good friend whose birthday is coming up this month, so I decided to go masculine with this sketch. 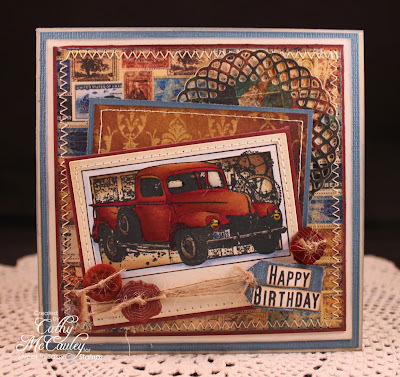 Creative Nugget: I love this vintage truck from the "Timeless Classic" clear stamp set by Sweet 'n Sassy Stamps. It's perfect for masculine cards. The Select White, Stormy Sky Core dinations, Bravo Burgundy, and Weekend Market DP by Bo Bunny papers were layered and stitched together following the sketch. These were adhered to a Select White card base. A PTI doily die was used to cut a piece of the DP for the circle layer. It's hard to see because of the layers, but there's actually part of a world map on this panel. The vintage truck was stamped in Memento ink, colored with Copics, and cut with a rectangle Nestie. Stitching, button twine, and buttons were added to this layer. The sentiment, which is really all on one line, was stamped and each word cut out to fit on the Stormy Sky tag. These vintage papers just seemed perfect for this image. I hope our friend likes it! Now for a bit of good news...FOUR stampers who entered our design call will be contacted this week to join the Sugar Baby Team! I can't wait to find out who you are! Speaking of the Sugar Babies...they have some fabulous samples for you this week to get your creative juices flowing. 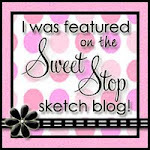 Sop by and leave a little love on their blogs, and as always, I can't wait to see how you use The Sweet Stop sketch this week. I hope you've been inspired by my sample...Thanks so much for stopping by! Have a wonderful weekend!